Juicy, bright and just the right amount of sweetness, strawberries are a summer time favorite. With Monin 1 litre plastic bottle strawberry puree you can enjoy the sensation of summer all year long. 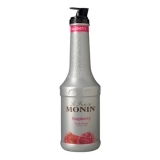 Monin Strawberry Fruit Puree adds sweet, juicy strawberry flavor and texture to cocktails, lemonades, iced teas and smoothies. Hearty aroma and taste of sweet strawberries; thick texture with strawberry seeds. Sugar, strawberry puree, natural strawberry flavour with other natural flavours, acidifying agent: citric acid, colouring agent: anthocyanins, preservative agents: potassium sorbate, thickening agent: pectin. Contains 50.1% strawberry puree.